One of the signs that I’m a little obsessed with open houses is that lately, in addition to visiting open houses every week in Santa Barbara, I also look for open house signs when I travel. So over the past several months, I’ve visited open houses in New Orleans, Catalina, and San Francisco. A couple of weekends ago, I was in St. Louis, Missouri, and went one step further by spending the whole day on a home and garden tour. My colleague Emily and I were in St. Louis for a meeting that started Monday morning. We arrived a day early to see a baseball game and take in a few sights. When the Cardinals versus Giants game was switched from daytime to night, we unexpectedly but pleasantly found ourselves with all day Sunday to fill. Hoping for some fresh air, regional flavor, and a little bit of history, we decided to check out the Lafayette Square Spring House and Garden Tour. We started our house tour at the Park House, built in 1866 and originally used as the Lafayette Park police station. The beautiful Victorian building with distinctive brick trim is now used as a meeting place for the Lafayette Square Restoration Committee, as well as hosting weddings and other events. A docent from the Restoration Committee was delighted to hear that we were visiting all the way from California, and gladly offered a history lesson of the neighborhood. Much like Santa Barbara and its 1925 earthquake, St. Louis’s downtown and architecture were shaped by a massive natural disaster. In May 1896, a cyclone decimated much of the city, turning whole blocks of homes into piles of debris and displacing many residents. Our docent, Matt, shared vintage maps and photos of Lafayette Park and the surrounding Lafayette Square. Prior to the cyclone, huge crowds often gathered in the park for concerts and events, and many residents slept in the park in the summertime. The police force stationed here helped oversee those activities until the cyclone devastated the neighborhood. Unlike Santa Barbara, the years following the historic cyclone in St. Louis were not a time of rebuilding. Lafayette Square fell into disrepair. Most of the structures in the square were either abandoned or operated as boarding houses. It wasn’t until the 1960s, when a highway was slated to be built through the square, that preservationists solicited national help to reroute the highway construction and preserve the square as a historic district. The first home tour was held in 1969 to showcase the history of the area and encourage people to visit. The increased attention helped fuel a resurgence of interest in the area, and homes began to be purchased by owners with plans to resuscitate and refurbish them. In 1972, Lafayette Square was named the first historic district in St. Louis and was added to the national register of historic places the following year. Matt let us loose for the rest of the tour with an enhanced knowledge and appreciation of the area. There were 11 more homes on the tour. 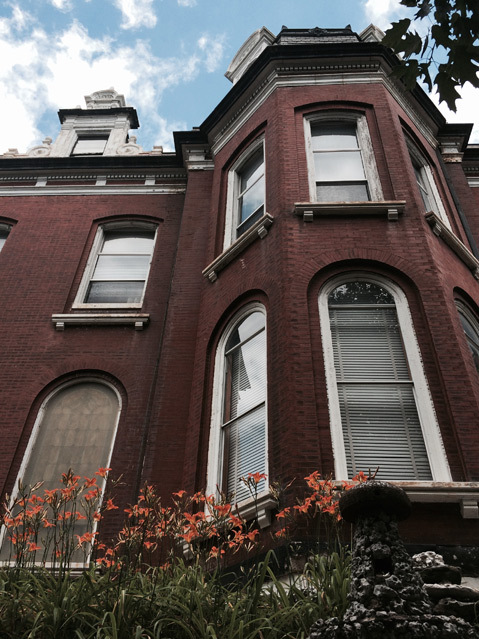 We visited a three-story Italianate mansion built in 1877 by James Eads, one of the top American engineers of the day. His influence gave context to the home’s impressive architectural features, such as the imposing curved walnut staircase and unique octagonal dining room, as well as details like intricate sliding pocket shutters on the floor-to-ceiling windows. Across the street, we met the new owners of a 7-bedroom, 3½-bath Edwardian home that sits on almost an acre of land with three carriage houses and extensive gardens. The three-story, 6,500-square-foot house was owned by the same family from 1923 until this year and has remained virtually untouched for that entire time. Original paint, wallpaper, woodwork, and window detailing are on display throughout the house, along with period fixtures and even furniture. Walking through this house and its gardens is truly like stepping back in time, and the plentiful stories about the previous owners — a doctor who saw patients downstairs while his wife conducted seances in the third-floor ballroom — certainly enhanced the effect. The amount of work ahead for the renovation of this grand home is mind-boggling, and made all the more real by having the opportunity to meet the owners and hear firsthand about their plans. Other highlights of the tour included a Methodist church with a beautiful 1901 pipe organ, intricate stained-glass windows, and a bowling alley in the basement. The bowling alley was built in 1948 and recently restored to its period glory, complete with the original pin-setting machinery, bowling balls, and even shoes. We visited a Victorian painted lady built in 1870, with a steep mansard roof and lush gardens in both front and back that’s one of three identical homes in a row. The exterior architectural details were highlighted by its color scheme, and the interior boasted original plaster moldings and fireplace mantels, as well. We were told that the layout of the house is a “four-back,” with the formal parlor leading straight through to the family room and then the dining room and kitchen, all in a row. The tour did not disappoint. We bought souvenirs at the craft fair and checked out a vintage baseball game in the park. We drank lemonade and chatted with other tour attendees. The size of the crowd confirmed that I’m not alone in my obsession with open houses. As expected, the homes themselves, along with their inhabitants, were certainly the centerpieces of the tour. The stories of their renovation efforts, and the determination of the owners to restore their houses and the neighborhood to their original glory, was made all the more poignant by the history lesson that our friend Matt had provided to start off the day. Whether red-tile roofs in Santa Barbara or wrought-iron fleur-de-lis-topped fences in St. Louis, the homes of an area can define its character and give a window into its past, and its future. The Lafayette Square Spring House and Garden Tour is an annual event. To find out more, visit lafayettesquare.org.